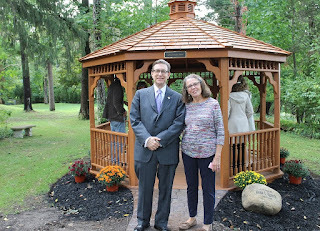 AMHERST, N.Y. -- Daemen College held a ceremony on Sept. 24 to officially open the institution's new reflective garden, a peaceful space on campus to spend time in quiet reflection and to honor the memory of those who have been lost in the college community. As part of the ceremony, the newly created public space was formally christened the Sabatino Reflective Garden, named in honor of Dr. Charles "Charlie" Sabatino, a beloved professor who passed away suddenly in 2014. "For some time, there has been a desire to have a quiet, peaceful place away from the bustle of campus activities where we can go for personal reflection and also to honor members of the Daemen community who are no longer with us," said Daemen President Gary Olson. "Thanks to the support of a number of donors, we have created this reflective garden for all to enjoy, and it is fitting to name it after one of Daemen's most thoughtful and beloved members of our community, Charlie Sabatino." 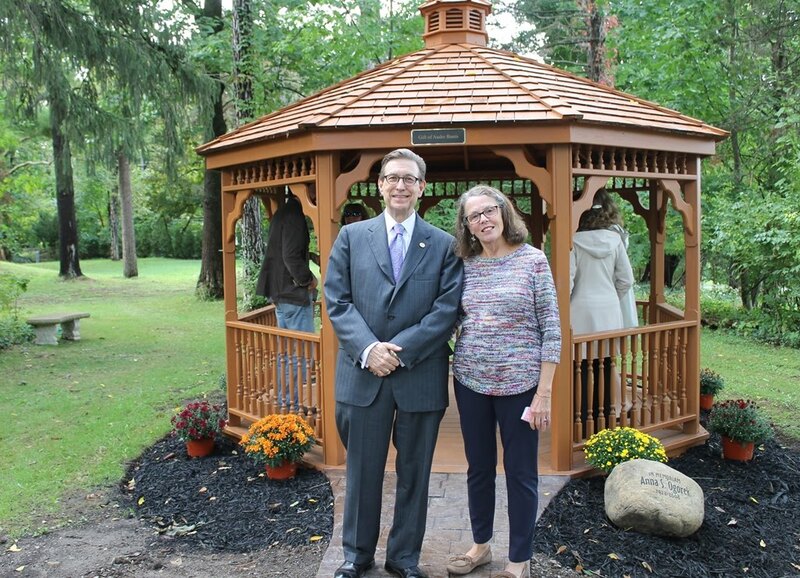 Nestled among the trees next to Alumni House, the reflective garden features a newly installed gazebo donated to the college by Daemen Trustee Audre Bunis. A cobblestone path leads to the gazebo, which is adorned with seasonal flowers and surrounded by stone garden benches named in honor of those who have been lost in the Daemen community, including Sabatino.